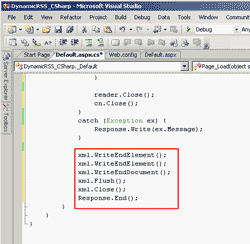 This post, I’ll cover only in the second section “Create ASP.NET Web Application on MS Visual Studio 2005 (C#)”. I’m not going to repeat other sections again since they’re same as in the previous post. 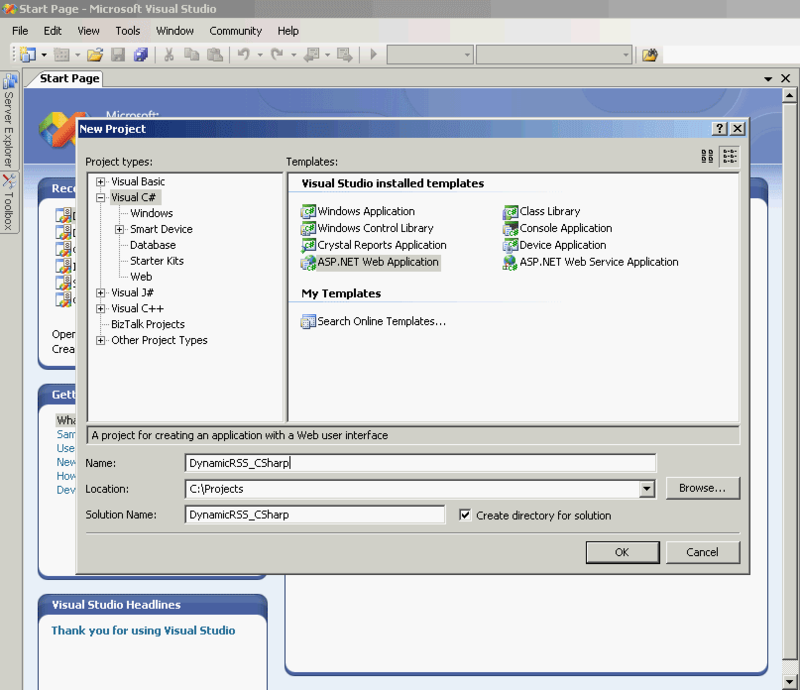 The other sections can be found in “Create Dynamic RSS Feed from MS SQL Server using ASP.NET, Part 1: VB.NET”. 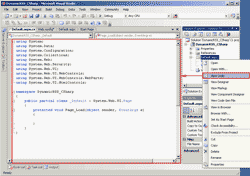 You can download the completed project for MS Visual Studio 2005 in zipped format – DynamicRSS C#The complete sections are listed below. 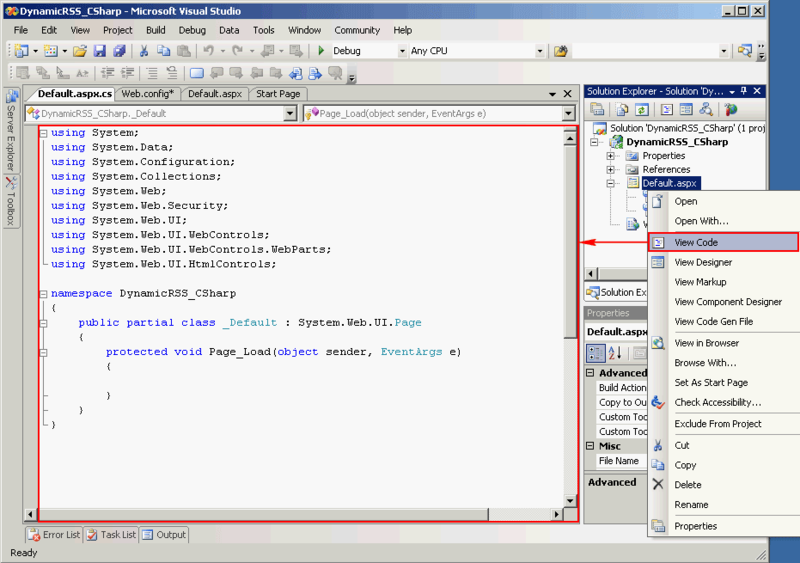 Open MS Visual Studio 2005, create a new ASP.NET Web Application. You’ll see the page as the figure below. Add some variables to the web.config so that these values can be changed without to recompile the project. 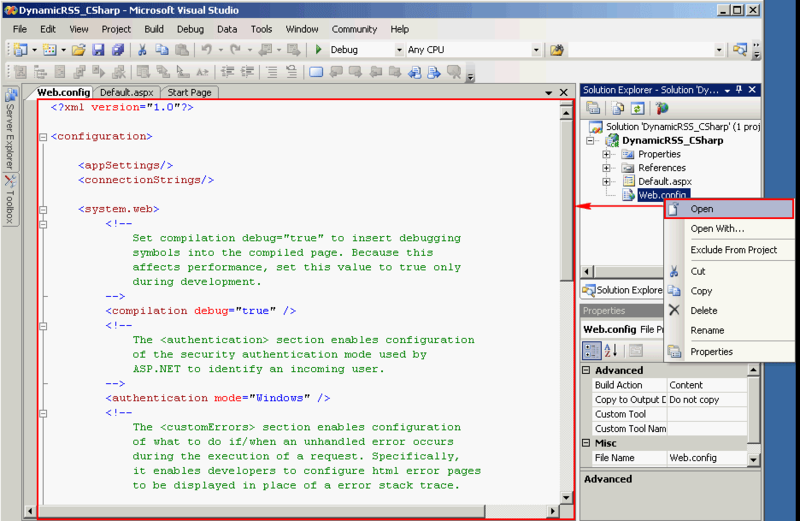 Right click on Web.config and select Open, you’ll see the page as in the figure below. Code Explanation: I have add two variables: “connStr” and “sp_name” which these values will be loaded into the code in next few steps. 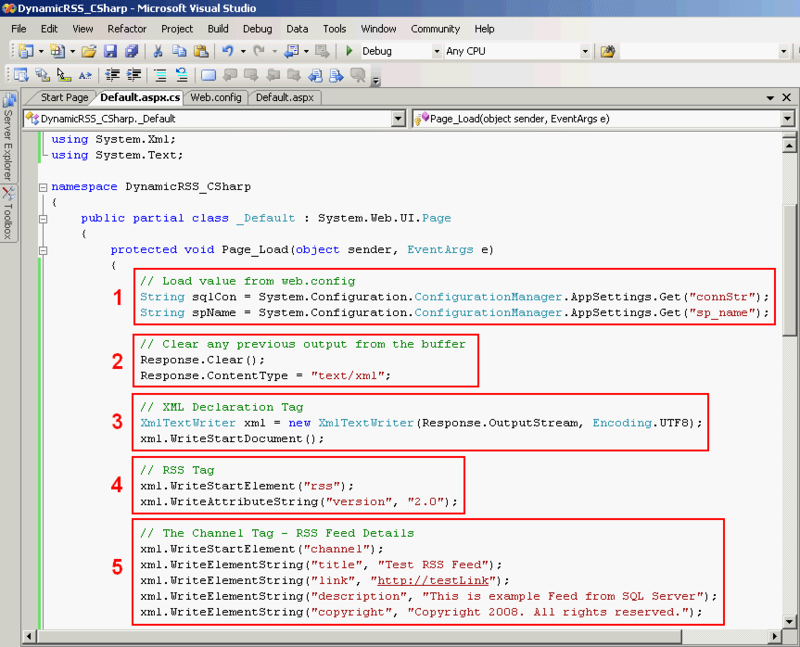 The first is the connection string to the database server provides with username, password and database name of the SQL Server. The latter is the store procedure name. I’ll change view to code so right click on the “Default.aspx” and select “View Code”. Import the required libraries on the top. 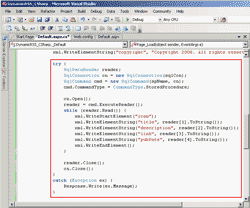 Code Explanation: The first library is used to make connection with the MS SQL Server. 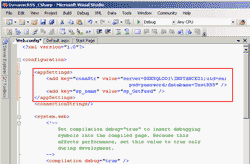 The second is for using xml format since RSS is a xml format. The last one is optional. Let’s start coding the first of the RSS. Type the following code in to the Page_Load(). Line 22-24: Load the values from web.config to variables. The name “connStr” and “sp_name” must match in the web.config -> appSettings -> attribute “key”. 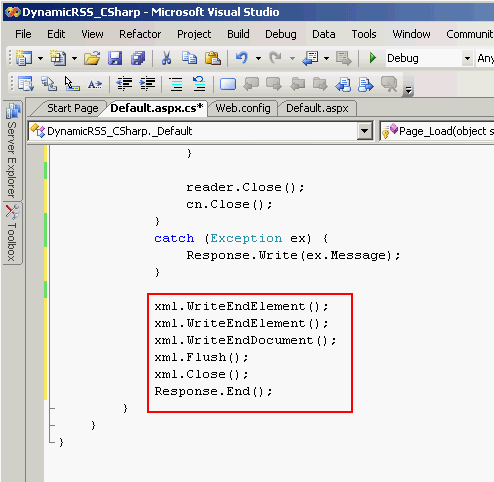 Line 26-28: Clear previous output if any and define the content type as “text/xml”. Line 38-43: Write channel tag which contains the details of this feed. Next, let’s coding on the middle part. 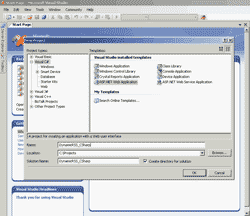 Connecting to the database server. Code Explanation: All the code in this part is wrapped into “Try…Catch” to avoid thrown exception. Line 46-49: Declare variables for make connection to SQL Server. 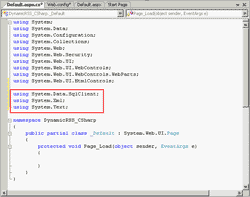 Line 51-52: Open connection to SQL Server and execute query by calling a store procedure “sp_GetFeed” (variable sp_name). Line 53-60: Enter while loop on each return record and write each record to output screen as a item. 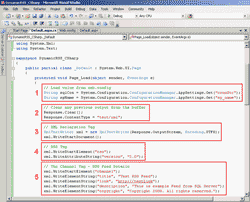 Line 62-63: Close the SQL Server’s conntection. The last part is about closing the opened tags. Line 69-70: Close channel and rss tags. Line 71-73: Close the connection. End the stream of data. Line 74: Send all result (in buffer) to display on the screen. In line 51-52, you mentioned variable “sp_name” for calling the procedure.I couldn’t find it. Login failed for user ‘sa’. 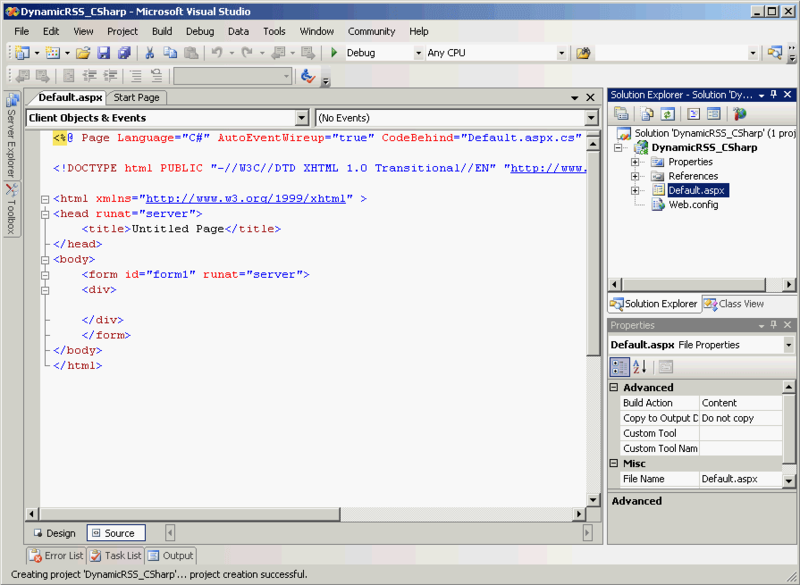 The user is not associated with a trusted SQL Server connection.ï»¿Test RSS Feedhttp://testLinkThis is example Feed from SQL ServerCopyright 2008. All rights reserved. Of couse this is not my real login name or password. Yet, I got the same when I did use them. Thank you. After that, try to refresh the page again. It works. But I am having trouble getting the published dates to show. Thank you. Does it show up in xml format? I mean in the IE. 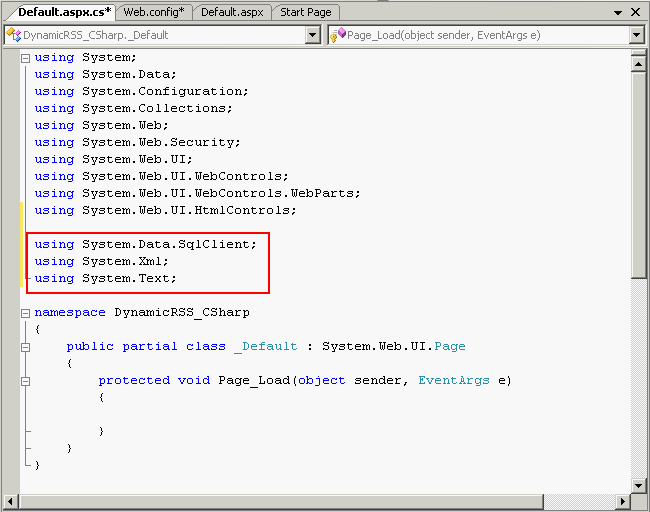 You may have to check the query result from the SQL Server if it contains all elements that you want. Is there any error message about why you can’t see on the laptop? And you can see xml of a page by view source code. 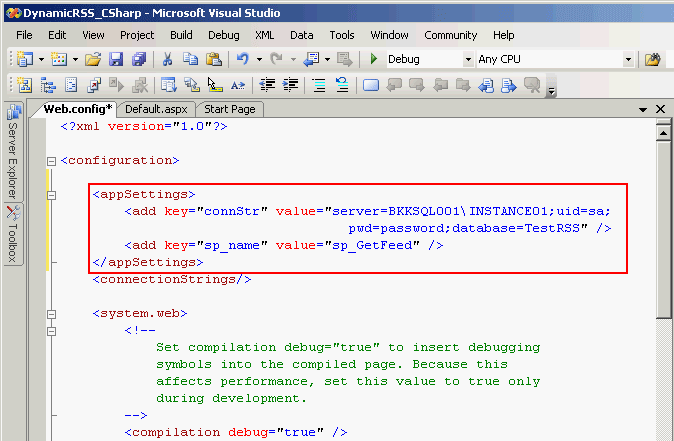 On IE, select View -> Source on the rss page and you’ll see the xml code which is sample for you to create one. 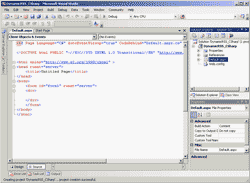 Most of browsers can view xml format. The example is as the last screen shot of part I.
i couldnt display at all. what was displayed on my browser was just the description. i dont have the other columns display on firefox. when i click on view page code for firefox,i could see all the information there. i guess it has to do with my browser settings. may i know what is the settings? What if you display it on Internet Explorer? Does it show correctly? Try to view a sample feed – http://www.feedforall.com/sample.xml. hmm…is it possible if i send you the screen shot of my web browser? so you have an idea of how it looks like? i have been trying but not really able to display everything in format…please advise. You can send me a screenshot in the forum. Or you may post a comment with source code as text here. Yes, if you want to add a parameter to url, you can add on the end of the text value. 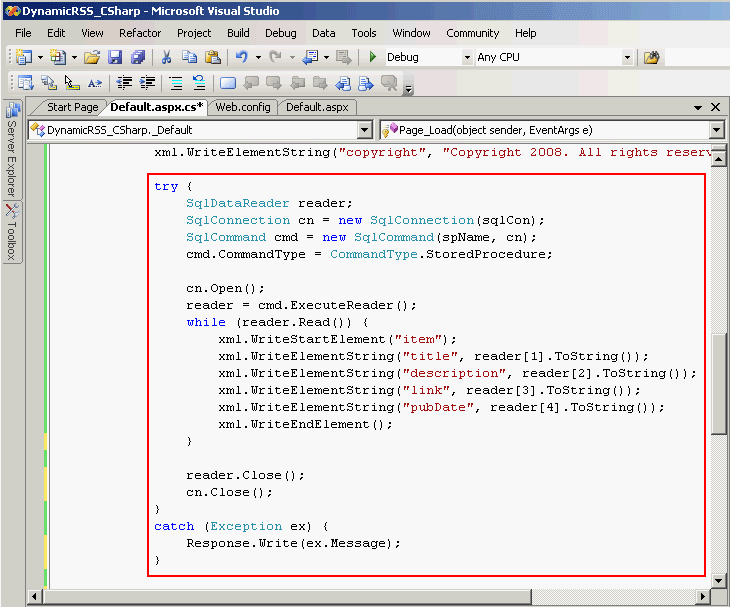 My only question is how can I alter it so that it writes to a file like myrss.xml? 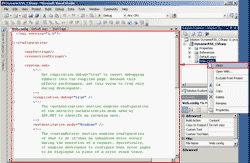 If you want the output to a xml file instead of on screen, you simply modify XmlTextWriter object on line 31.
where xmlFilePath is the file destination. Dear Linglom team thanks for the above info you have no idea how much the info you provided has helped me with the project we’re currently working on. The error says ” the name ‘CommandType’ does not exit in the current context. 7 warnings in Web.config says, “Could not find schema information for the elecment ‘appsettings’.